Adrian Lam’s first win, Joe Bullock’s first try and a comfortable victory before the World Club Challenge - only the harshest critic would find too much to complain about. Yes, there were areas which they need to tidy up before Sydney Roosters arrive in town next weekend, and yet they still scored 34 points against big-spending opposition - it was both satisfying and richly encouraging. 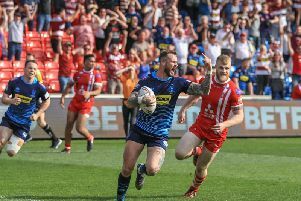 The Warriors may not technically be off the mark - owing to the salary cap punishment on the eve of the new season - but this was a win that delivered so much more than two points. There were flashes of attacking brilliance, with George Williams pulling the strings, as they came from behind to lead 22-12 at half-time and shut the game out in an entertaining final quarter. But the win may have come at a cost after Dan Sarginson left the action at half-time with an ankle injury. And there may be repercussions for Leeds, too, after sub Mikolaj Oledzki was placed on report for allegedly biting Sam Powell at the end of the opening half. Lam and counterpart Dave Furner made their Wigan debuts together at this venue nearly 18 years ago to the day. They returned as rival head coaches and both seeking their first win with their new clubs following opening day losses. Lam stuck with the same 17 which went down 22-12 at Saints - Morgan Escare again missed out - meaning home debuts for Zak Hardaker and Bullock. Leeds’ side featured all three of their big-name NRL recruits - Konrad Hurrell, Tui Lolohea and Trent Merrin. Lam had demanded a big response from his players and leading 22-12 at half-time, many fans would say he had got it - but like the previous week, they gifted their opponents an opening try. This time, Tom Davies spilled a regulation catch and Ash Handley was on hand to scoop the ball up and cross for a second-minute try which Lolohea converted. The game seesawed for quarter-of-an-hour, as Sarginson - looking sharp - plucked out Williams’ floated kick to lock the scores. Moments later Sarginson did well to dive down and defuse a teasing Lolohea kick. Leeds, playing more direct than in their 26-6 loss at Warrington, retook the lead when Tom Briscoe’s pinballing run led to Brett Ferres thundering over to make it 12-6. But in the second quarter, Wigan took a grip of the game with three unanswered tries. Oliver Gildart’s flick pass to Davies deserved a try and, though they were denied, Ben Flower pounced on Thomas Leuluai’s high-bouncing grubber for his second try of the year. A similar-style try on the other flank - this time Joe Greenwood touching down Williams’ stabbed kick - put them 16-12 ahead. And then the try which earned the loudest cheer, as Bullock marked his home debut with his first try for the club. The ex-Barrow prop takes some stopping in full flow - incredibly, he was a winger when he played in Wigan’s academy. Hardaker’s goal wedged a 10-point gap between the sides. Leeds didn’t wilt. Twice offloads didn’t work out and when Lolohea broke from deep it needed Gildart to track him back. The opening half ended on a sour note, with Leeds sub Oledzki placed on report for allegedly biting Powell. Sarginson’s withdrawal prompted a reshuffle, with Isa moving to right centre and Gildart reverting to his preferred spot on the left. They started the second-half brightly, dominating territory and possession and stringing together neat attacking passages which tested the Rhinos’ resolve. The visitors briefly worked their way back into it, but their ball-control was sloppy and disjointed - leaving Furner shaking his head. With no further score as the game headed into the final quarter, Hardaker elected to boot a 63rd minute penalty to nudge them 12 points clear. Davies had a try chalked off by video referee Robert Hicks but Wigan looked well in control. So much so, there was a sense of inevitability that they would score soon - which they did when Williams’ footwork and power took him over the line to establish a 28-12 lead. Leeds’ short kick-off from the restart paid dividends - Kallum Watkins swept over moments later - but Wigan wrapped up the win when Hardaker sent Liam Farrell clear.